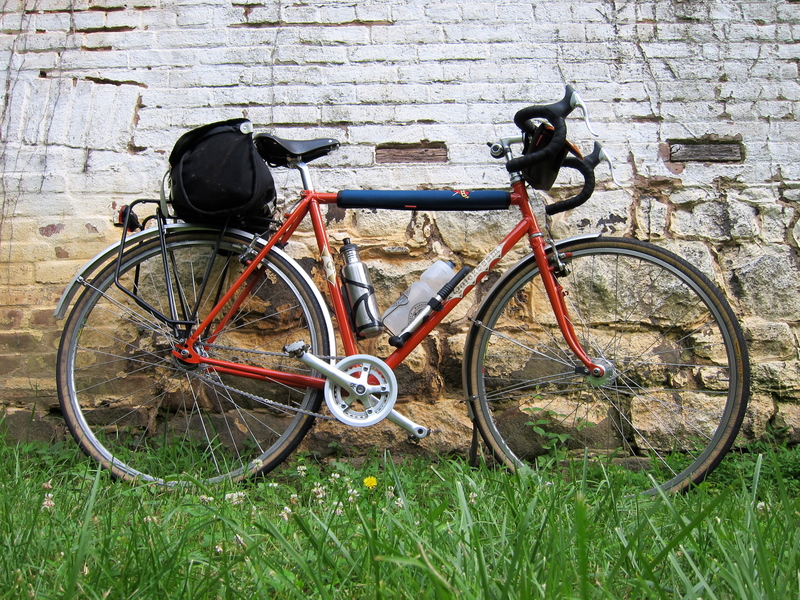 This weekend I snuck in some time to do a 50-mile solo outing on my Rivendell Quickbeam. After all the tandeming with Felkerino, this was an excellent way to change up the bike riding. Purchased in 2004 or so, Rivendell no longer makes the Quickbeam. 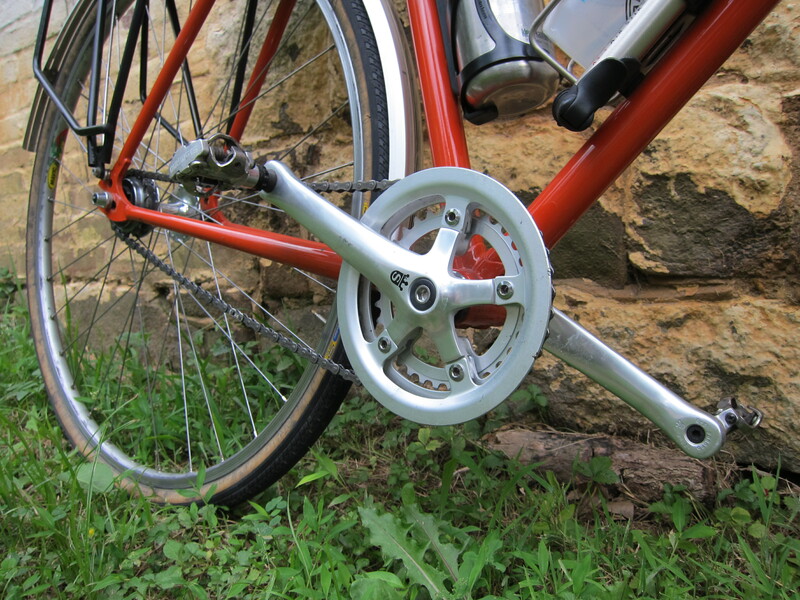 Rivendell changed their single speed model from the Quickbean to the SimpleOne. Felkerino has one of the latter. However, they stopped selling those as well, and I do not believe that Rivendell is currently making a single speed. 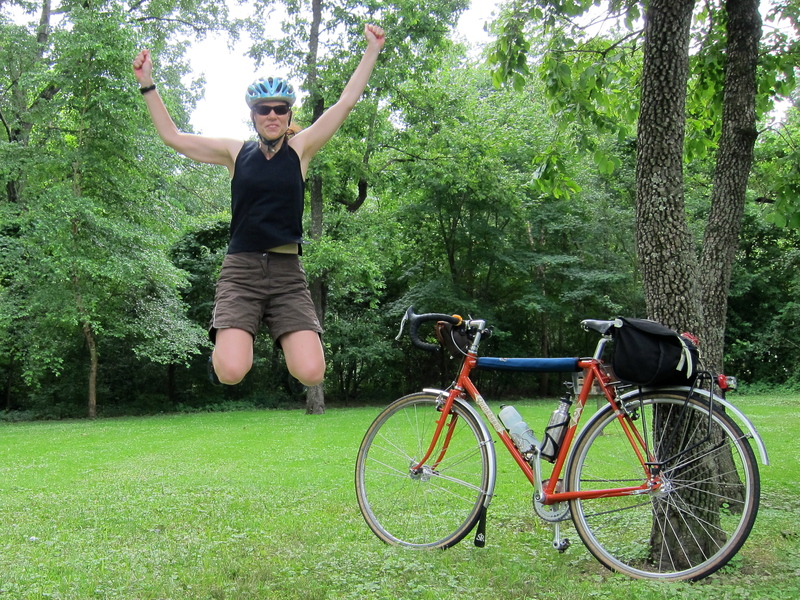 My Quickbeam probably offers the starkest contrast in ride from our Co-Motion tandem of any of my bikes. Both bikes fit me perfectly, but aside from that they are so different from each other. The simplicity of a single speed is wonderful. I never have to think about shifting, only about how to approach the next rise. My gearing is pretty low, 40×18, making the bike ideal for rollers (say the ones on the Custis Trail) or for carrying a little bit of a load. The Quickbeam is among the lighter bikes I own and has a lively responsive feel. The word that comes to mind to describe this bike is lithe. That feel is partly because I am not working to get two people in motion, just me, but it’s also the nature of the ride. I really love going uphill on my Quickbeam. Hills are when I notice how much less effort it is to get a single up a hill compared to a tandem. It’s a refreshing difference to feel the oomph of your legs pushing into the pedals and have your bike move forward that much faster in response. People sometimes ask me if my Quickbeam is fixed. No, it is not, as I revoked my fixie license for my own safety. Also, I love coasting downhill. Venturing out for the occasional weekend solo adventure is a reminder of my own strength and abilities. I’m not a fast rider– I don’t keep a cycling computer on the Quickbeam so I cannot tell you how fast I’m not– but I keep a steady pace and get down the road without a lot of drama. The single speed helps me fall into my own ride. I can only pedal so fast or I start to spin out. Shifting is not an option. I suppose I could manually drop down the 32-tooth front ring, but that is really not practical shifting. If people pass me, I don’t think about it much. It’s easy to sink into the rhythm of the road. There is something meditative about a single speed and something good for the soul about the occasional solo ride. They bring balance to my cycling and renew my appreciation for the varied types of riding that comprise my rich bikey life. “…Everyone needs some time away.. a holiday.. from each other…” Sometimes being alone, away from the “Co-Motion” is indeed most helpful..! That’s some vertical! I’m all slow-twitch, so jumping that high seems like a miracle to me. I’m with you on the joy of riding solo, and also just one gear. My favorite mountain bike for a long time was a cannondale 1FG. It forced you to just ride and concentrate on fundamentals. Hmmm… my stoker likes seeing the bike go faster up a hill on the tandem. That is why I can’t get her to ride her single any more! I get the independence of a single vs tandem. The joy of individuality vs added rewards of a team effort. A funny text and humorous! Thanks for share your impressions with us. A very beautiful bike too!